The first of two double issues, this installment is jam-packed with contributions from the growing number of writers and scholars connected to the magazine. Godard’s ubiquity is still very much felt, with articles on Letter to Jane (1972, co-directed by Jean-Peirre Gorinand Two or Three Things I Know About Her (1967). 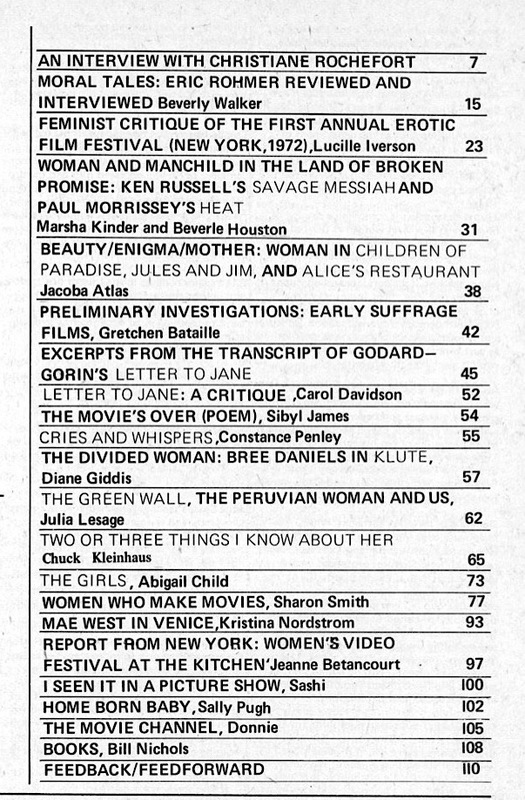 However, this issue also sees the inclusion of an article by Sharon Smith, who lists the filmographies of 170 women filmmakers from 25 countries, research she would later publish as Women Who Make Movies in 1975. PDF of Women and Film, no. 3-4 , entire issue. 35 M large file.